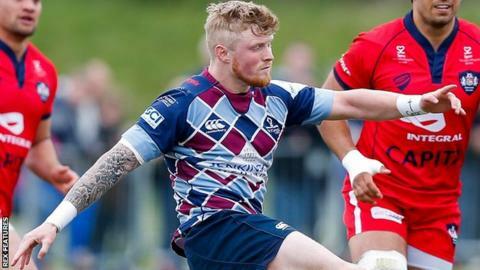 Jersey have signed five players in preparation for next season in the Championship, including former Sale Sharks centre Jordan Davies. The 26-year-old, who has played rugby league for Salford, will join from Rotherham in the summer. Prop Mark Tampin and back row forward Max Argyle will also leave the Yorkshire side for Jersey. George Eastwell has signed from Loughborough Students while Jake Armstrong will arrive from Doncaster. Jersey are fifth and could still make the Championship play-offs, but will not go up to the Premiership if they are successful as they do not have a suitable ground. Head coach Harvey Biljon had previously said he was three players away from finalising his squad for next season.